Rancho Californio (Upper Lake) is dedicated to historic research and preservation of many aspects of Americas rural heritage, including raising American Heritage Livestock and thereby helping to preserve rare or near-extinct DNA so future generations can benefit from livestock biodiversity. Though the Rancho specializes in Old Spanish California, it casts its net far afield in search of any wisdom from the Old Ways that can guide us toward living more in harmony with our natural environment and the changing seasons. One of the most effective ways to reduce your carbon footprint and increase your health is to eat LOCALLY GROWN food, and to eat food IN SEASON. Life in Rural America revolved around the changes in season, with season-specific chores and cuisine. Necessity, seasonal abundance, and a frugal waste-not-want-not mindset were the genesis for many practices and recipes which today have become disconnected from their practical, rural roots. Equating each chore or cuisine with the season in which it originated, is a way to re-connect yourself with Nature and the rhythm of the planet. Modern American diet has become reliant upon gas-guzzling refrigerator trucks importing produce from other countries and continents at all times of year (when we are not eating highly refined processed foods, that is). We have become a nation out-of-touch with the simple basics of sound nutrition, good health, and living lightly upon the land. Below, Rancho California shares recipes and tips for enjoying wholesome healthy dishes featuring Lake County area produce. Yes, we know, pumpkins ripen in fall and traditionally were stored for winter consumption. And we do store and use whole pumpkins here at the ranch, throughout the winter and into early spring. With proper curing and storage, a pumpkin can last up to 6 months. But we also grow very BIG pumpkins here, and whenever we cut one up, there's always plenty extra. There's only so much of a 70-pound pumpkin you can eat at one sitting! Our process is to cut the pumpkin in half, spoon out the inards (seeds are washed, then baked on cookie sheets with coating of soy sauce, making a healthy salty snack), then bake the two pumpkin halves for 2 hours or so at 300 degrees. When cool, part of the pumpkin is used right away (soups, pies, bread, puddings...), part is fed to the chickens, and the rest is squeezed into used 1-quart yogurt containers and then frozen. We have a giant chest-freezer for long-term food storage, and it will hold 50 quarts of frozen fruits or vegetables in addition to hundreds of pounds of home-butchering. Throughout the year, homegrown pumpkin by the quart is as easy as pulling one out of the chest freezer and putting it into the refrigerator to defrost, which takes 1-2 days. The USA is one of few countries in the world where pumpkin is not a daily routine food, year-round. Here, pumpkins are wasted as Halloween lawn ornaments. I won't even say "and used in pies" because most people making pumpkin pie will open a can from the store, not grow their own. Such a shame. Pumpkin is an incredibly nutritious, easy-to-grow food staple. All measurements listed below are guesstimates, since creative cooking is not an exact science. If you don't have jujubes (aka Chinese Dates, which we grow here at RC), try raisens, or any sweet dried fruit. In medium (2 quart) pot, cook 1-2 cups rice in 2-3 cups water until rice is done. Add jujubes (or raisens or other dried fruit), stir. Add maple syrup -- stir. Taste batter. If not sweet enough, add more maple syrup. Pour into olive-oil-coated baking dishes, bake at 325 for one hour. Insert fork to test, if fork comes out dry, it is done. If wet, cook some more. Serve as a side-dish or as dessert. and therefore all information below is based upon our Hachiya experiences. In olden days (and still common in rural areas like Lake County), at least one persimmon tree could usually be found on most farms or ranches. 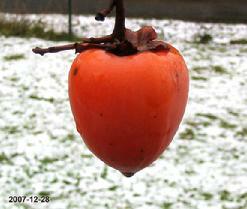 Not only are persimmons winter-hardy, but they actually NEED frost to ripen! How cool is that? A fruit that ripens in December was a highly cherished treat, for snow-bound folks who otherwise might see long stretches without fresh produce. Since persimmons ripen a month or two after the fall walnut harvest, recipes that use persimmons AND walnuts are a natural for Lake County. This fruit is seen by many as an exotic rarity, passed over by folks who have never encountered it except at the grocery store, where it can be prohibitively expensive. Lack of familiarity with innate persimmon-persnickity-ness can lead to grief, and a person with the commendable cullinary courage to venture $2.99/pound to experiment with this exotic fruit could wind up horribly disappointed if, in their ignorance, they sample the persimmon too soon, before it is fully ripe. An unripe persimmon is a lip-curling, nasty experience! Bleh! Astringency is due to large amounts of tannin, the same as found in tea. As the fruit ripens and sweetens naturally, the tannin disappears. So, the key to success is to wait until the persimmon has begun to turn into mush, its sides beginning to cave in as the inner fruit takes on the consistency of partially-set jello. If the stemmy part resists parting company with the fruit, it is not yet ripe. Once fully ripe, handling persimmons becomes problematic as they want to disintegrate in your hand and must therefore be handled delicately. But they are worth all the trouble! There is irony in the exorbant price one finds on persimmons in the grocery store, in that if you happen to have a persimmon tree of your own, you are probably having trouble GIVING the excess fruit away! Here at RC, we give at least 50-100 pounds away every week from December - January, and it still seems as though half the harvest winds up on the ground, rotting. 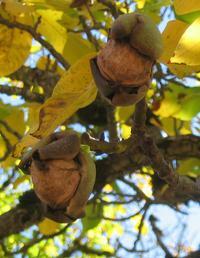 But that's because our ONE Hachiya tree produces at least 500 pounds of fruit every winter! Even just one mature tree can provide more fruit than any single family can consume. 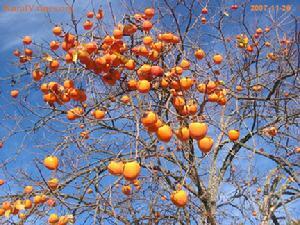 So part of the joy of owning a persimmon tree is that one can gift friends and neighbors with the excess abundance! The below recipes are based on the idea that if you have a persimmon tree, or know someone with a persimmon tree, then you have a cheap, unlimited supply of persimmons available. Please do not buy grocery-store persimmons at $3/pound to cook these recipes -- such extravagance would defeat the whole purpose of frugal cookery, especially since those store-bought persimmons could have been grown 1000 miles away. Instead, if you do not have a tree of your own, or know someone with one, try driving the county roads until you find one. Consider stopping to ask if the property owner is interesting in sharing the fruit. They might be happy to have you pick all you want, because if left unpicked, the fruit will drop to the ground and cause a gushy mess. Here at Rancho Californio, winter is the season to eat persimmons almost every day. That's really not hard to do. See below! Very fast-and-easy to make! Tastes kind of like bread pudding. Clean and remove stems-and-tops from fully ripened (mushy) persimmons. Remove any large seeds that might be embedded within the fruit, otherwise dump fruit (including skin) in blender or food processor. Add eggs and seasonings per your own favorite taste. Brown sugar, molasses or REAL maple syrup can be added for additional sweetness, but only if you have a powerful sweet tooth. The persimmons alone are deliciously sweet. Blend thoroughly, then pour into slightly oiled cassarole dish. 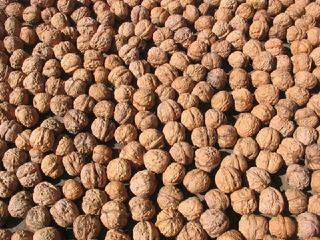 TOPPING: After sprinkling walnuts and brown sugar (or molasses or maple syrup) evenly over the top, use a fork to gentle swirl around the surface and push the walnuts down into the liquid a bit, or they will just stay on top and burn during the baking. The sugar caramelizes during baking, making a crunchy sweet crust on top. Yum! Place a single layer of nuts on cookie sheet. Generously slather with real maple syrup and sprinkle with cayenne pepper. Remove from oven and taste. Stir, mix again. Add more syrup and/or cayenne to taste. Remove and cool completely dry before placing in a container.